When the federal Conservatives drafted Bill C-23, the so-called “Fair” Elections Act, did they expect it would garner so much attention, becoming a major topic of conversion among politic geeks? Did they anticipate the near universal condemnation the bill has received? Or was this all a nasty surprise? But shouldn’t you need ID to vote? Apparently feeling this is their best defense, the Conservatives’ talk about ID issues a lot: That vouching is too open to voter fraud, that 39 different pieces of ID can be used instead. What they fail to mention is that the ID you present must contain your current address, and most ID does not. The only common piece of ID that does is your driver’s license—but not every Canadian drives. Most non-drivers currently back up their address-less government ID with the Voter Registration card. However, Bill C-23 would make that card inadmissible. Vouching has been another backup, but again, Bill C-23 would ban that practice. So, arguably, you should not need ID to vote, actually. But if a government decides to require it, they must do it in a way that account for circumstances such as have recently moved, living in an institution, having a PO box as a mailing address—or being unable to drive. Not doing so is voter suppression, and is likely unconstitutional. What if they fix the ID thing? Then we good? Severely limiting what information Elections Canada can share with Canadians, and specifically preventing them from promoting voter turnout. This will kill certain educational programs such as Student Vote. It also may mean that they can’t share the results of their investigations. Allowing the ruling party to nominate poll supervisors for local voting stations—positions that clearly required neutrality, not partisanship. Increasing spending limits, and allowing parties to exclude the costs of contacting anyone who has donated to them in the past five years. Can you say loophole? Requiring that robocall records to be kept, but only for a year—not enough time for a full investigation (as the still-ongoing investigation into the fraudulent robo-calls of 2011 demonstrates: three years and counting). During hearings, the Conservatives have been unable to come up with a single expert who agrees with this bill. (One they had been quoting testified that they were misrepresenting his report.) In fact, I don’t recall such universal condemnation of something they tried to do since they banned the long-form census. So they have taken to dismissing all their critique as “self-described experts” or “celebrities”, and personally attacking them: Election Canada’s Marc Mayrand (appointed by Harper) is power hungry. Sheila Fraser (praised by the Conservatives for her work as Auditor General) is a paid shill. It’s been really nasty. Also, having delivered the bill two years after they said they would, not having consulted ahead with anyone on its contents, they are now trying to rush it through as quickly as possible, limiting debate through time allocation. Why are the Conservatives doing this? Other controversial policies, such as GST tax cuts or harsher sentencing laws, are very popular with some people. They are policies that will win them votes, and help raise money. So no mystery why they propose those ones. But electoral law? Not motivating like money and safety. Sure, diehard Conservatives agree with them, as they do on everything, but this issue just isn’t going to be a big vote-getter or money-maker. That’s one theory. That Conservatives are angry they were found guilty of electoral fraud in 2005, that several of them have been charged with over-spending during the last election, that they are still under investigation because their voter database was used to commit electoral fraud (the robocalls directing people to the wrong polling stations) in 2011. They feel picked on, so they want to take power away from Elections Canada as punishment. About those robocalls: Another theory is that Elections Canada is finally, nearly ready to give its reports on what happened with those in 2011. And the Conservatives, being in government, have an idea what’s in that report, and it’s not good. 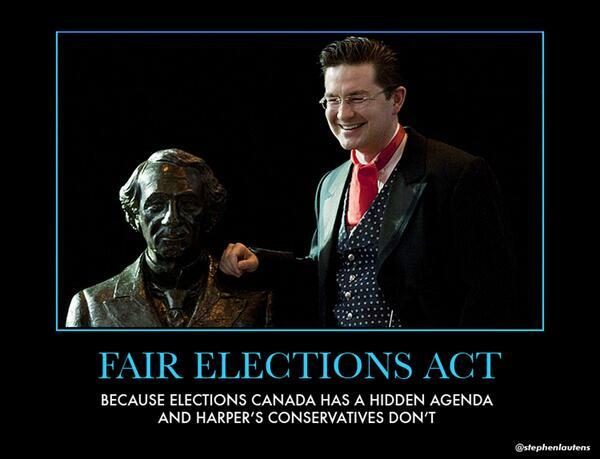 So they need this law to pass now so Elections Canada can’t talk about it and they won’t face any repercussions. c) Is it a nefarious plan to rig the next election? The Conservatives aren’t so popular right now, remarkably so given that the economy isn’t doing too badly. And there is no doubt that many provisions in this act favor them: They could put biased people in charge of polling stations; they could reduce voter turnout among youth and aboriginal, who don’t tend to vote Conservative; they could spend more money than ever advertising themselves and attacking other parties (and they do have more money than other parties). They could even do more fraudulent calls, with even greater hopes of getting away with it. Maybe they think this bill is their only chance of winning in 2015.
d) Is it megalomaniac belief that every bill they put forward is pristine and perfect and that anyone who disagrees with them is a silly poo-poo head? Given this party’s incredible fondness for time allocation to suppress debate on every bill they introduce, combined with an unwillingness to entertain any amendments from any other party, ever: Entirely possible. Whichever theory you prefer, none of them makes the Conservatives look very good here. And also, you know, vote. Preferably for a party that cares about your right to do so.